[S382] Family web site titled "Alford American Family Association", www.alfordassociation.org, viewed Aug 2007. [S382] Family web site titled "Alford American Family Association", www.alfordassociation.org, AAFA Action Summer 1997, viewed Aug 2007. 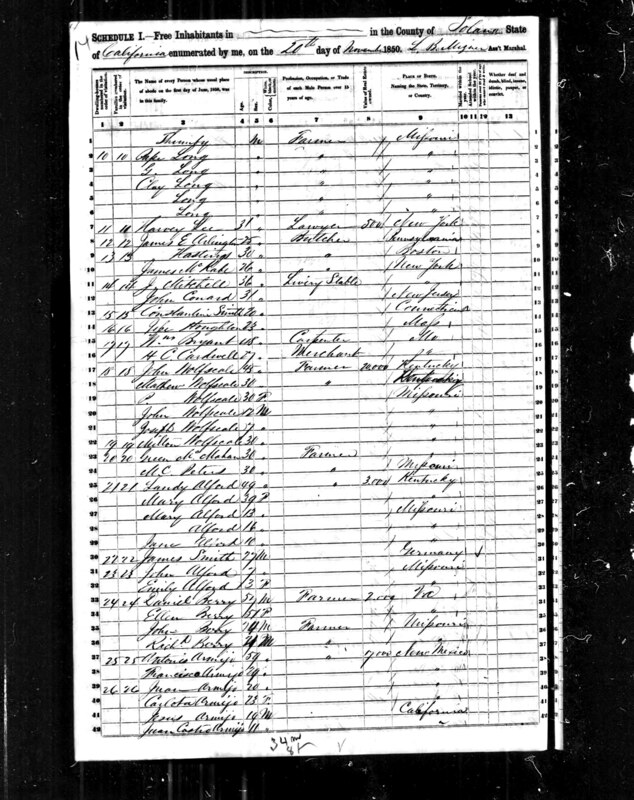 [S6407] California State Census 1852, Solano, unknown county, California, Sacramento, CA: CA State Library, Digital image Ancestry.com Operations Inc: 2010,, Landy Alford head of household, roll M432_36, page 7B. [S6408] 1850 US Federal Census, Not Stated, Solano County, California, digital image Ancestry; National Archives micropublication, Lunda Alford head of household, roll M432_36, page 7B. [S498] Mary Beth Wheeler, family tree titled "Ancestry of Bob and Mary Beth Wheeler", published by Ancestry.com, wc.rootsweb.ancestry.com, from database named mbwheeler, updated Nov 2014, viewed Dec 2016. [S498] Mary Beth Wheeler, family tree titled "Ancestry of Bob and Mary Beth Wheeler", published by Ancestry.com, wc.rootsweb.ancestry.com, from database named mbwheeler, updated May 2007, viewed Sep 2007. [S476] Michael, family tree titled "The New England Mathers with a special emphasis on the many families who married into our family", published by Ancestry, wc.rootsweb.ancestry.com, from database named mikemather63 (formerly mikemather), updated Sep 2016, viewed Sep 2016. [S774] Robert Anderson, The Great Migration, Boston, MA: NEHGS, 2007, Vol III p 71. [S476] Michael, family tree titled "The New England Mathers with a special emphasis on the many families who married into our family", published by Ancestry, wc.rootsweb.ancestry.com, from database named mikemather63 (formerly mikemather), updated Aug 2009, viewed Aug 2009. [S795] David A Wells, family tree titled "Wells & Scott Genealogy (USA & South Africa)", published by Ancestry.com, wc.rootsweb.ancestry.com, from database named daw744, updated Oct 2016, viewed Dec 2016. [S774] Robert Anderson, The Great Migration, Boston, MA: NEHGS, 2007, Vol III p 70. [S486] Dave Utzinger, family tree titled "Dave Utzinger's Database", published by Ancestry.com, wc.rootsweb.ancestry.com, from database named michelotti, updated Oct 2011, viewed Oct 2016. [S486] Dave Utzinger, family tree titled "Dave Utzinger's Database", published by Ancestry.com, wc.rootsweb.ancestry.com, from database named michelotti, updated Nov 2009, viewed Nov 2009. [S521] Scott, family tree titled "Robinson Roots", published by Ancestry.com, wc.rootsweb.ancestry.com, from database named srobin0789, updated Apr 2008, viewedApr 2008. [S759] Susan, family tree titled "Susan Rockwood Bradley", published by Ancestry.com, wc.rootsweb.ancestry.com, from database named velvet49, updated Oct 2009, viewed Nov 2009. [S459] Margaret Sheffler, family tree titled "BANFILL-BUCK-HAWKINS-PIKE-PERRINE", published by Ancestry.com, wc.rootsweb.ancestry.com, from database named mscheffler, updated Feb 2008, viewed Apr 2008. [S914] Aaron Sargent, "Births, Marriages and Deaths in Malden", NEHGR , published 1857, volume 11-12, page 352, 84, 49 (Boston, MA: New England Historic Genealogical Society). [S262] Letter from Stevia Sargent Lesher to Linda Sargent Reinfeld, ,, Feb 1999. [S376] Robert G Lesher, family web site titled "Lesher of Colorado", www.lesher.net/genealogy, Aug 1007. [S3692] Robert Underhill, family tree titled "Underhill Lineage 2017", published by Ancestry.com, wc.rootsweb.ancestry.com, from database named underhill2016, updated Sep 2010, viewed Sep 2010. [S376] Robert G Lesher, family web site titled "Lesher of Colorado", www.lesher.net/genealogy, Aug 2007. [S395] Obituary Notice, Hartford Courant , Hartford, CT, 15 July 2007.